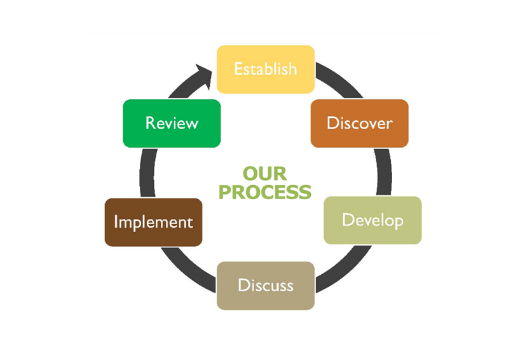 Our process is one of the most important underlying elements of delivering measurable advancement in helping to achieve the client’s objectives. While the challenges may differ between a private and corporate plan sponsor, our in-depth planning approach uses a systematic approach for each of our clients to determine where you are in your current plan what you desire to achieve going forward and what you are willing to commit to achieve the stated goal. This process is the foundation to successful planning for both types of clients. Plans are not static. Implemenation or putting the plan in action must include a robust system to monitor the plans advancement toward success, including the underlying plan assumptions and the financial tools implemented. Discover Meeting – Our initial meeting is to understand you… your goals, your vision and your concerns, as well as, to introduce ourselves, our firm, our experience and our philosophy. Develop – In order to provide a detailed recommendation based on your situation, our advisors need to collect detailed financial data. These include statements, insurance policies, wills, trusts, etc. Implementation – A plan is not worth the paper it’s written on, unless you take action. Our advisors can help you take the appropriate action to turn your plan into a reality, by going to the marketplace to identify and purchase investment vehicles, insurance, etc. Review – A plan is not static. It is constantly changing. Therefore, our advisors need to continuously monitor and review your plan and any financial instruments they may have implemented, to ensure that it adheres to goals and objectives for you and your family.